Bringing LED technology and art together! These compact, little 7/8" round LED fixtures are quite versatile with uses ranging from recessed step lighting, under railing lighting or as a deck surface mount. Features include a frosted lens, removable and replaceable LED back box, and easy-to-install no hardware design. 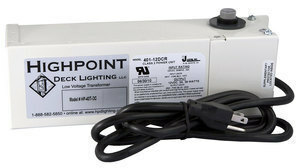 Kit Includes: 8 Endurance Lights, 40 Watt DC LED transformer w/photo eye, wire nuts and 100' of 18-2 wire. Kit Includes: 16 Endurance Lights, 40 Watt DC LED transformer w/photo eye, wire nuts and 100' of 18-2 wire.